Choose ONE from these 3 FREE DRINKS: (F3) 3Q Passion Fruit Green Tea, (G4) Fresh Milk w. Grass Jelly or (G6) ‘BOBA’ Milk Tea. One person is entitled to ONE free drink only. Valid from 29th – 31st Dec 2014, 3pm to 5pm only. 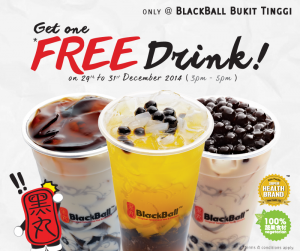 Only valid at BlackBall Bukit Tinggi Outlet.